Andromeda Conquest is one of the first galactic conquest games ever made for the PC. 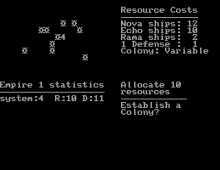 Not surprisingly for a game this old, the gameplay is quite simplistic – the entire game was coded in BASIC, and takes up the staggering amount of little more than 10 kilobytes. Andromeda Conquest is essentially a Risk-style space strategy game, in which 1 to 4 players compete to form galactic empires and eliminate others. These empires are formed by establishing new colonies in far flung star systems and then defending them, and the first player to hold ten systems for an entire turn wins. Despite the limitations of BASIC and its age, Andromeda Conquest still manages to offer quite a long game, with the maximum of 48 star systems, each with its own unique attributes, such as strange life forms and technologies. Each player begins the game with a home planet and ten resource points. As the game progresses, players accumulate more resources from their colonies. More resources lead to faster expansion and stronger defense. The game is quite similar to SSG’s Reach for the Stars, although much more simplistic and accessible. Overall, while Andromeda Conquest is not a classic game that stands the test of time very well, it deserves recognition as one of the first games of economic management and planetary conquest— and represents a solid start in PC gaming for boardgame giant Avalon Hill.